Born in Mendoza, Argentina, FEDERICO DIAZ is an upcoming versatile musician of the new generation of guitarists with a multi-faceted career as a performing artist, arranger and composer. His performances have taken him to distinguished festivals and concert halls in more than 20 countries including: Wiener Saal and Solïtär (Salzburg), Otto Braun Saal (Berlin), Clara Schumann Saal and Kleiner Saal der HfMDK (Frankfurt am Main), Stadttheater (Mainz), Lisner Auditorium (Washington DC), Trinity Center (Philadelphia), SCAR (Rio Grande do Sul), Teatro Solis (Montevideo) and Teatro Independencia (Mendoza). He has appeared as soloist with the National University of Cuyo Symphony Orchestra, the Mozarteum University Chamber Orchestra and the Polish Chamber Orchestra Sopot. Federico is an avid chamber musician concertizing regularly with Lionel Cottet (cello), Emilio Argento (viola), Ada Meinich (viola), and a variety of string quartets. 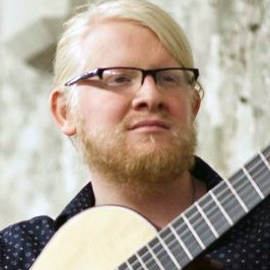 As a soloist member of Ensemble d´Argent, a string orchestra based in Frankfurt am Main, he has had the opportunity to perform new works as well as new arrangements for guitar and string orchestra every year since 2012. In addition to classical music, Díaz has a passion for tango, Argentinian folklore, and improvisation. He has been featured as a leader, arranger, and guest artist with many important musicians of the scene in Argentina as well as in Europe. Currently hes working with Bruno Cavallaro in a new program for violin and guitar based on new versions and new compositions of young tango composers. Additionally, he continues performing with tango pianist Pablo Woizinski (duo DiaZ-WoiZ) and with jazz pianist Juan Emilio Cucchiarelli (duo Doble Tango).